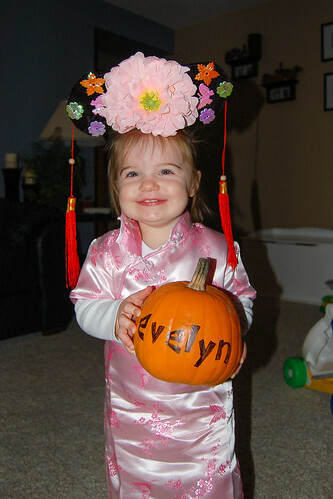 Evelyn dressed up as a Chinese princess this year for Halloween. 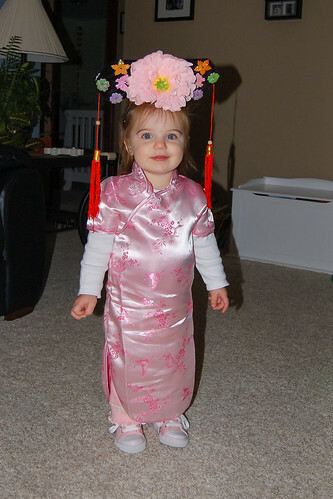 The dress and headpiece are actually from China - Evy's Pap has been working there recently, and he and Gram brought them back for her as souvenirs. We decided to just write her name on the pumpkin she picked out from Trax. After all, it is tough to carve a jack-o'-lantern with a plastic spoon. This year Evy got her first taste of trick-or-treating by visiting four houses. She ended up with a bag of chips, two fun size candy bars, and a special goodie bag complete with her name on it. But most of her evening was spent on our front porch in her beach chair handing out treats to the neighborhood kids. And getting her first taste of apple cider. Evy had a really good time this Halloween and maybe next year she'll even be allowed to eat the treats she gets. Other than the Kit Kats. Those are for Daddy. What adorable pictures. I can't believe she let that huge hat on her head. There must be some theater in her future the way she puts up with dressing up in costume. I'm glad she got some apple cider. 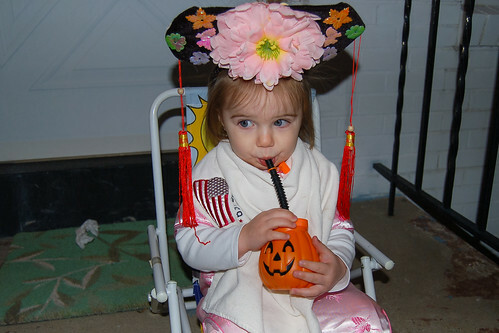 She must have been parched from all her trick-or-treating. Happy Halloween!